Satira is the daughter of a whore, who has spent the last several years working for Nathaniel. Like her mentor, Satira is mechanically gifted, but unlike her mentor, because she’s a woman she is forbidden to officially study and join the guild. Wilder is a bloodhound. Bloodhounds are men who have been changed by the government to help control vampires. Nathaniel has been kidnapped by vampires, and now Wilder and Satira have to go into the lands controlled by the vamps to get him back. The only problem is that the New Moon will soon be upon them, and Wilder will have to deal with his curse. This is a steampunk adventure, and I like Satira, and I liked the world building, but good grief was there a lot of boinking. I think a full third of the novella was sexual escapades, which just isn’t my thing. So as much as I liked the characters and world building and story, I’ll probably skip any new books, because that’s a LOT of boinking. First things first, THIS IS A BOINKING BOOK. See the publisher? Samhain Publishing, Ltd? They print erotica. So you have been warned. But here’s the thing. I really really like her world building. Wild West, except that vampires exist in the wilds, and frontier towns are subject to raids by the vampires. So a guild is formed and created bloodhounds to fight the vampires. I find myself fascinated by her world. By a guild that recruits broken men and turns them into monsters who exist to save people from vampires. And although these are stand-alone books, the story builds upon the previous books, both in the stories of the secondary characters, and as we learn more about the Guild that created and controls the bloodhounds. He sounded like Kierkegaard as he struggled for purpose in his new embodiment. That’s the stuff that interests me. Not that the boinking bits are bad, I just like her world building and characters enough to put up with all the boinking. This is the next book in the Bloodhounds series, and IS A BOINKING BOOK. LOTS OF BOINKING. Why do I keep reading this? Because I find the world she created fascinating. Bloodhounds are humans who were created/remade/manipulated to fight vampires. They have keep the towns in the wild West safer (but not safe) from the vampires who prey upon these isolated groups. Archer is sent to Crystal Springs, both to try to resolve the problem problem the town has been having with vampires boldly preying on the folk, and to attempt to redeem himself from the events in Wilder’s Mate. 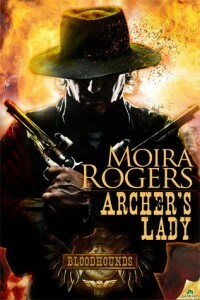 What he discovers when he arrives is a schoolmarm who isn’t quite as she seems, and a female bloodhound–something the Guild would very much like to know about, but which the woman’s protector had done her best to keep from happening. Of course the schoolmarm (who is running from her past) and Archer, who is trying to redeem himself, are attracted to each other.